Maple sugar. Another gem in the culinary world. In reality, it’s hardened maple syrup,dessicated into a raw-sugar consistency. More specifically, it’s the left over maple sap after the maple production/boiling process is complete. It’s normally formed into cubes or sold as candy. It’s very sweet (very!) and has somewhat of a concentrated maple flavor. It’s delicious, natural, and really works well with salmon. As do most things maple. 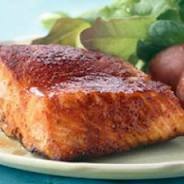 As I have posted before, a great way to prepare salmon is through a quick-cure process. One or two hours of cure, followed by a gentle cook process can make for some of the most delicious salmon. In this case, we use 1/2 cup maple sugar, 1/2 cup salt and a few aromatics, and that’s it. Cook it gently over a very smokey hardwood fire or cedar plank roast it, and you might have one of your next favorite salmon dishes. Combine the sugar, salt and lemon zest in a mixing bowl. Place the salmon on a sheet tray, skin side down, and evenly pour the cure mix over the salmon. Let sit uncovered in the refrigerator for 2 hours. After 2 hours, wash the cure off the salmon and pat dry. Prepare your grill. You want medium heat with lots of smoke. In a small sauce pan combine the syrup and bourbon. Slightly reduce, remove from the heat and swirl in the butter. Place the salmon, skin side down on the grill in a cooler spot on the grill. Indirect heat works best. As the salmon cooks, brush the maple/bourbon glaze on. Continue brushing the glaze on the salmon until the glaze is gone. When the salmon is cooked (just over medium is perfect), remove from the grill and serve right away.